Account administrators are now able to configure the features that are available to end users. They can do this in the new ‘Self Service Settings’ section of the Settings console. When the first option is switched off, end users will not be able to submit requests for others. This can be useful for HR departments that want to restrict access to the requests they handle as much as possible due to the sensitive nature of the information that these requests may contain. 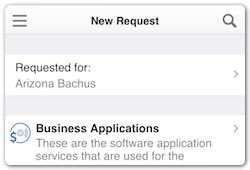 When the second box is checked, the end users will not see the None of the Above button at the bottom of the list of service categories and services when they are submiting a new request. They are therefore required to select a service. In some cases, this can remove the need for a service desk. That’s because the submitted requests will be assigned automatically to the correct support team for each service. 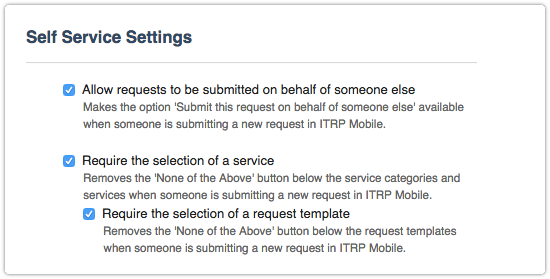 By checking the third box, it is possible to require end users to select a request template. This option should only be used by support organizations that have prepared a complete set of request templates for each of their services. Each set could include a generic template for when something is not working properly (to report an incident), for suggesting an enhancement (i.e. an RFC) and for asking a question (i.e. an RFI). When you are the administrator of a support domain account (i.e. when your organization has a directory account) then the options that you select only affect the end users when they submit a request for your support domain. This allows each support domain to have different settings, even though all end users go to the directory account to access 4me Self Service regardless of the type of support they need. Allowing each support domain to have its own setup is important because an IT department may have different requirements than an HR department. The settings that are specified for 4me Self Service also dictate the configuration of 4me Mobile.